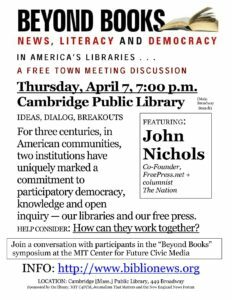 For three centuries, in American towns large and small, two institutions have uniquely marked a commitment to participatory democracy, learning and open inquiry — our libraries and our free press. Today, as their tools change, their common missions of civic engagement and information transparency converge. Economic and technology changes suggest an opportunity for collaboration among these two historic community information centers — one largely public, one largely private. How? On Wednesday and Thursday, April 6 and 7, 2011, Journalism That Matters, (the American Library Association,) the MIT Center for Future Civic Media, the Media Giraffe Project at UMass Amherst the New England News Forum and the Donald W. Reynolds Journalism Institute invite you to join in a work session for civic information transparency that builds from and beyond books. What might libraries do to facilitate community social news networks? Must free speech be absolute within a taxpayer-supported institution? How do we define the boundaries between engagement and partisanship? Are libraries poised to become public-access media centers as cable fades? Should a library operate a news collective, non-profit or citizen-journalism service? How can libraries help preserve a free digital information commons? Among our collaborators are(alpha order): Joe Bergantino (New England Center for Investigative Reporting), Jessica Durkin (New America Foundation fellow), Mike Fancher (RJI / Seattle Times-retired), Marsha Iverson (King County libraries), Library Leadership & Management Assn. (LLMA), Alan Inouye (director, Office of Info Tech Policy, ALA), Nancy Kranich (Rutgers Univ., chair ALA Center for Public Life), Lorrie LeJeune and Andrew Whitacre (MIT C4FCM), Peter Levine (CIRCLE at Tufts Univ. ), Leigh Montgomery (Christian Science Monitor librarian), Donna Nicely (Knight Commission/Nashville Public Library), Laurie Norton-Moffatt (Norman Rockwell Museum), John Nichols (FreePress/The Nation), Patrick Phillips (Vineyard Voice), Josh Stearns (FreePress.net), Colin Rhinesmith (Univ. of Illinois), David Weinberger (Harvard Library Information Lab), Bill Densmore, (New England News Forum/Media Giraffe Project/Reynolds Journalism Institute). For information about lodging, see our lodging page.